As you know that nowadays we use chose submersible pump motor on the place of other pump motor, that’s why I am writing this post about single phase submersible pump starter wiring diagram and a video tutorial which help you understood the complete wiring connection. This will be your complete guide from installing or wiring of submersible pump motor wiring connection. Today I open a submersible pump control box and change the change the motor capacitor because the old capacitor weakened and I replace it with new one. I saw the diagram on the back side of box which locked on my mobile by using mobile camera. Today I will share with the complete diagram of submersible pump. In submersible motor we use wire connectors, DPST switch (double pole single throw) , capacitor and reset able thermal overload protector. From the switch we can switch on or off the motor , and reset able thermal overload protect our motor during high current flow. Here is the complete diagram of single phase submersible pump starter wiring diagram below. 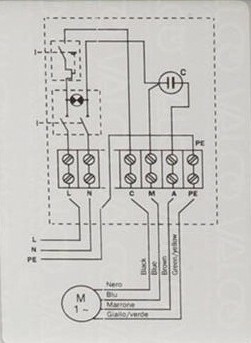 I hope after watching the above single phase submersible pump starter wiring diagram guide video tutorial, I hope now you will fully understood the complete submersible pump control starter wiring diagram or installation and now you will be able to wire or make your own submersible pump motor starter, however now if you have any question regarding the video tutorial or diagram then you can ask your question by using the below comments section.